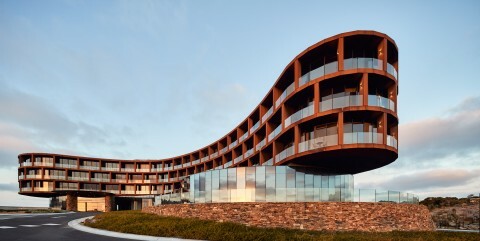 The design for Cape Schanck Resort Redevelopment has been directly affected by the extraordinary coastal context in which it is sited and specifically the land on which it is built. The soft, rolling dune-like quality of the topography calls for an architecture that is fluid and sculptural. Reclining into a natural cradle in the coastal and golf landscape, the form of the building reaches across its site in three directions, and is made up of a primary structure sitting upon a heavier plinth, anchoring the building to the land. This evokes the imagery of an object that has been slowly revealed by natural erosion and provides a constantly shifting profile of the building as it is viewed from various points around the surrounding site. 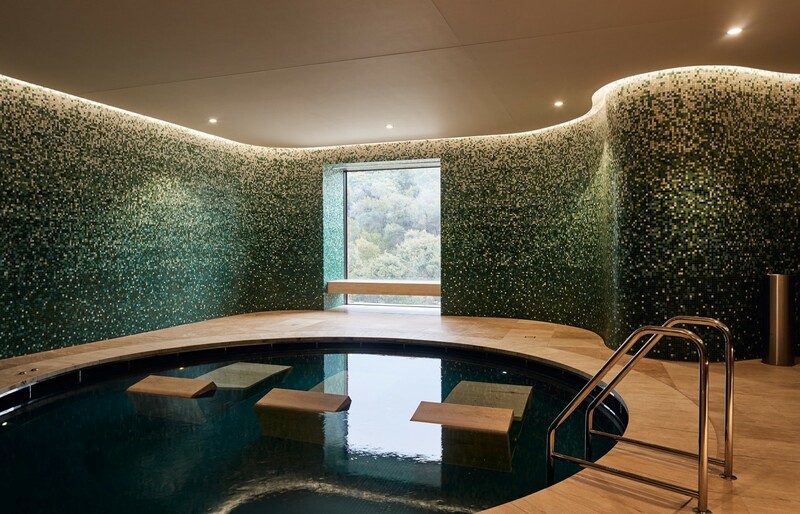 All facilities are directed to the north with distant views over the golf course towards Port Phillip Bay and to the south and west toward Bass Strait. The building sits directly behind the existing club facility, which will be replaced with a north-facing garden and recreation area. At the ground level, the recreation, golf and cafe facilities open directly to this outdoor recreation area. Directly above is the entry level, a predominantly glass facade, set well back with a large protective overhang and surrounded by terraces. Looking over these terraces are conference facilities, restaurant and lounge capitalising on the north facing façade and views to the bay, ocean and landscape. 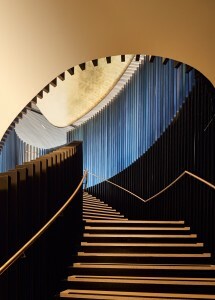 The hotel element of the design then soars across this base element, contrasting against the heavier form while twisting to pull in all available views from the site. The materiality of the building has been chosen specifically for its ability to age gracefully over time. 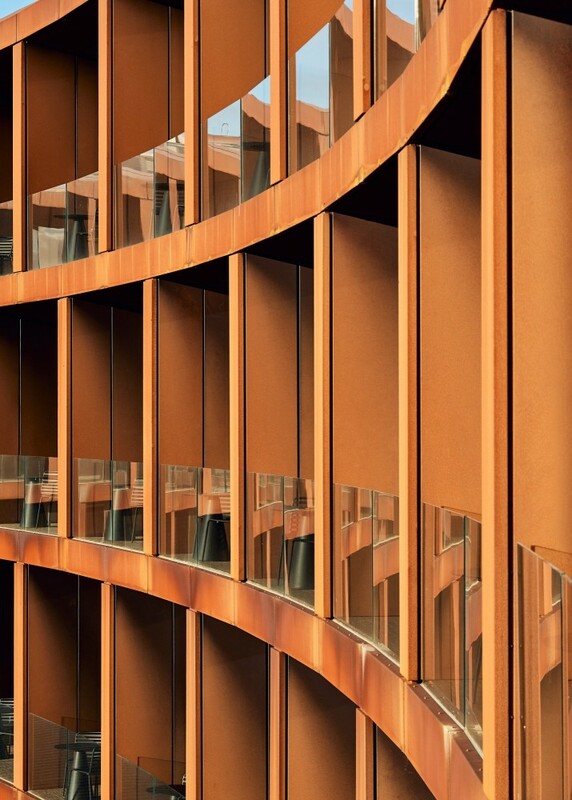 The flowing cellular arrangement of the hotel levels are informed by a concertina of Corten sections that over time will be enhanced as they shift and adjust their colour, eventually holding a subtle variety of natural shades closely corresponding with the local natural textures. The rocky plinth supporting them similarly relies on a material connection to the local palette, evoking the variety of strata found in, and affecting the form of, the local rocky outcrops.